Rami Malek and Lucy Boynton celebrated Bohemian Rhapsody ahead of this weekend’s Oscars! The co-stars and rumored coupled stepped out for Vanity Fair and Genesis’ toast to Bohemian Rhapsody on Friday night (February 22) at Cecconi’s in West Hollywood, Calif. They were also joined by their cast mates Gwilym Lee, Ben Hardy, Joseph Mazzello, Allen Leech and Mike Myers. Other attendees included Queen singer Adam Lambert as well as Brian May and Roger Taylor. During the event, guests enjoyed cocktails and drinks from Belvedere Vodka, Jane Walker by Johnnie Walker, Hennessy XO and Peroni Nastro Azzurro. Bohemian Rhapsody is up for several awards at the Oscars including Best Picture as well as Rami‘s nomination for Best Actor. FYI: Lucy is wearing a Celine dress and Malone Souliers shoes. 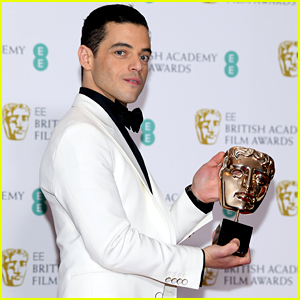 Rami Malek shows off his award in the press room at the 2019 EE British Academy Film Awards on Sunday (February 10) at Royal Albert Hall in London, England. 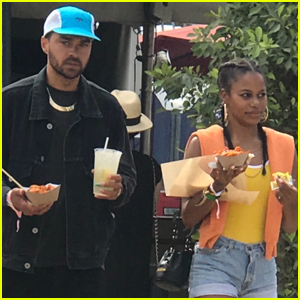 The 37-year-old actor won the award for Best Actor in a Leading Role for his work as Freddie Mercury in the movie Bohemian Rhapsody. FULL WINNERS LIST: See who won every award! 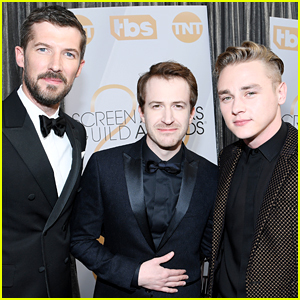 Rami‘s co-stars Gwilym Lee, Joseph Mazzello, and Ben Hardy – who played the other members of the band Queen – were also spotted on the red carpet. Bohemian Rhapsody picked up the award for Best Sound as well. FYI: Rami is wearing Louis Vuitton with a Cartier watch and cufflinks. Ben is wearing Saint Laurent. Rami Malek and Lucy Boynton are so excited about their big night at the 2019 Golden Globe Awards! The Bohemian Rhapsody co-stars and real-life couple celebrated their wins at the FOX, FX And Hulu After Party on Sunday night (January 6) at The Beverly Hilton Hotel in Beverly Hills, Calif. They were also joined by their cast mates Ben Hardy, Gwilym Lee, Joseph Mazzello and Mike Myers. The group had a lot of reasons to celebrate as the film took home Best Motion Picture the the drama category and Rami was awarded Best Performance by an Actor in a Motion Picture in the drama category! Rami Malek Brings 'Bohemian Rhapsody' To Japan! 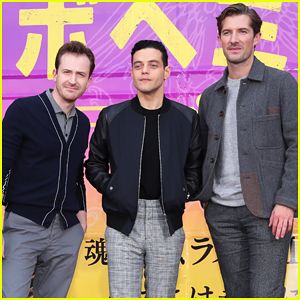 Rami Malek gets in-between his co-stars Joe Mazzello and Gwilym Lee while posing for a photograph at their photo call and press conference for their hit film Bohemian Rhapsody held on Thursday (November 8) in Tokyo, Japan. The biopic of legendary singer Freddie Mercury, played by Rami, and his band Queen will be released in Japan on November 9. Joe plays John Deacon and Gwilym plays Brian May in the film. Bohemian Rhapsody won the box office in its debut over the weekend stateside. The film earned around $50 million in its opening weekend and it’s generating a ton of Oscar buzz for Rami.